Such a great Wine Dinner hosted by Capitol Cellars in Boise. The featured wines were from Parma Ridge Winery. And if I may so bold as to say, if you need something to do on a Friday, Saturday or Sunday, give the Parma Ridge Winery Restaurant a try. Chef Storm Hodges does an awesome job in the kitchen while Stephanie serves some great wines. The wine dinner served consisted 1 appetizer and 3 entrees and Parma Ridge wines that were perfectly matched. The 2014 Merlot that was served with the Pork Ballontine is in short supply – they have mostly sold out. 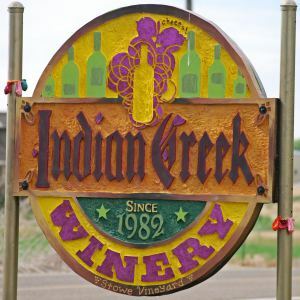 A wonderful Idaho Merlot and we were lucky enough to get 2 bottles! Yea! Here is how the dinner went. Delicious! Stephanie and Chef Storm Hodges. Owners/Winemakers of Parma Ridge Winery. I did not get a photo of the appetizer, Amuse Bouche, an apricot-prosecco sorbet served with a 2015 Parma Ridge Winery Chardonnay. This was a super good chardonnay. you really do need to get some of this wine. superb! It was a grand release party! And now the 2C label is official. The wines are good, I liked the blend the best, but they had to use Yakima Valley grapes. Hope they start using Idaho grapes in the next release. It was fun seeing all the folks last night – it was really full! Lots of people. Here are some photos from the evening. Enjoy and visit them at Capitol Cellars web page. Left-Click any of these photos to see them enlarged. As a note, the photo to the above is across Main Street from Capitol Cellars at 5th and Main Streets. The Veltex sign has a long history in Boise, and I always wanted a photo of it. Logan Smyser, General Manager, passes some appetizers. Red 2C Blend released. I liked this best. Just some of the available appetizers. The kitchen staff did a wonderful job. Thank-You! This just came in from Logan Smyser of Capitol Cellars. Tasting of the new Capitol Cellars label. Should be fun! “I wanted to remind you all that we are having our 2C Wines Release party this evening from 4-6 p.m.
We hope you will join the Smyser family and the Capitol Cellars team in celebration this evening! Really a good visit tonight to the newly opened – March 2015 – of Capitol Cellars at 5th and Main Streets in Boise in the Belgravia Building. (There is also an AirBNB in the building, Belgravia AirBNB.). The ambiance is like entering a “wine cave”. Dim lights; cool air and wonderful Waite Staff. In certain sections of the restaurant, it is like sitting in a wine cellar – because you really are! I have placed a permanent link in the sidebar of this blog so you can contact them, make reservations or check their manu. Definitely a 4-Star (out of 5-Stars) restaurant. My only comments about the food is that the risotto seemed to be a little gummy – undercooked. The crispy fries were not really as crispy as I had expected. I expected more of a twice fried Belgium style potato. Here are some photos from our visit. Enjoy! It is great to see that they use Idaho products and produce as much as possible. This would be a great Date Night restaurant or Special Occasion. The entrance at 5th and Main in the Belgravia Building. Part of the main dining room. Logan Smyser, Director of Operations, shows us how to use a sabre to remove the top of a champagne bottle.